I've done another die cuts card but this one is a special Thank You for a cat lover friend of mine. Her young daughter has 2 Siamese cats so I did my best to color them appropriately. I know both of them are going to love this card. I used scraps of CS to do the die cuts. 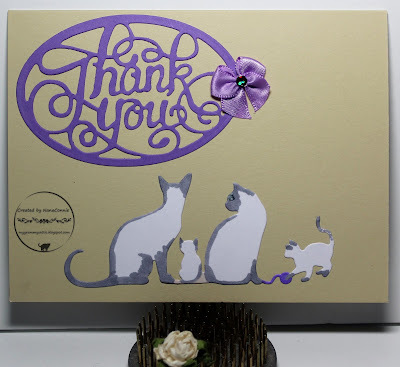 The cat family die is from Cheery Lynn and the Thank You oval was cut with an Unbranded die. I used ProMarkers to color the gray on the cats and the bit of purple on the ball of yarn. I dug in my stash to find one of my hand-sewn bows; it was white but I 'dyed' it with a violet ProMarker. Once I learned that technique of dying with a marker, I only use white ribbon for my bows. That way, I get bows which are exactly the color I want. I added a small gem to the center before adhering it to the card. What a gorgeous card! I love the cats! Awesome coloring of these die cuts, Connie! They certainly look like Siamese kitties! Gorgeous card and just adore the cats. I hope you are enjoying your weekend. Such a lovely and very personal card Connie - I love it! It's a shame that cats make me wheeze like an old accordion - but they're cute a lot of the time from afar! Great card! Love how you have customised the cats!! You Siamese kitties are precious and your card is beautiful! SO lovely. Super sweet card. I really like the use of die cuts. I am very happy, today we are opening our blog of challenges, there are still some things to be solved, but you can participate and I, like the other DTs, would be very happy that you would come play with us. Come and meet us with this new point of friendship, fun, challenges and lots of joy. Below is our link, both blog and facebook. It will be great to have you with us. A big kiss and I'll wait for you there. Beautiful card. Love the CAS design. Thank you so much for entering our ATG challenge at Through The Craft Room Door this week. Looking forward to see you again next challenge. What a lovely card!! Thanks for joining us at DCD this week! Of course their going to love it, it's gorgeous. This is adorable!! love how you colored them, they look just like Siamese cats! I think I have that same "thank you" die and I haven't used it yet. Thanks for the inspiration and thanks for playing with Jo's Scrap Shack. Great card, love the Siamese cats, so elegant. Thanks for joining us at Quick Quotes! what a sweet card! thank you for sharing with us at Quick Quotes this month. The Felines Made Me Post This!